Nakamura beats Rapport; Adams has near miss vs Eljanov; Vachier-Lagrave retains lead. 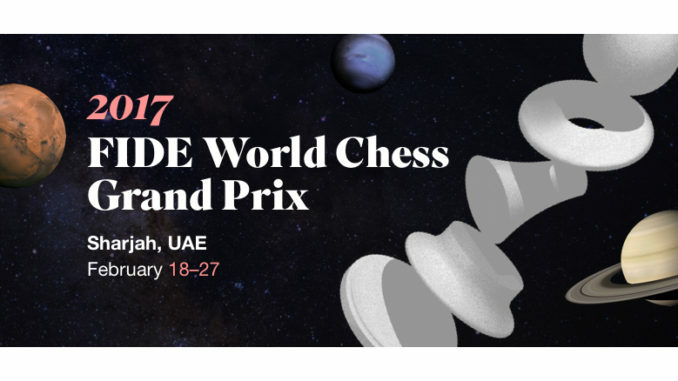 Round three of the FIDE Grand Prix 2017 in Sharjah, was played on Monday February 20th. 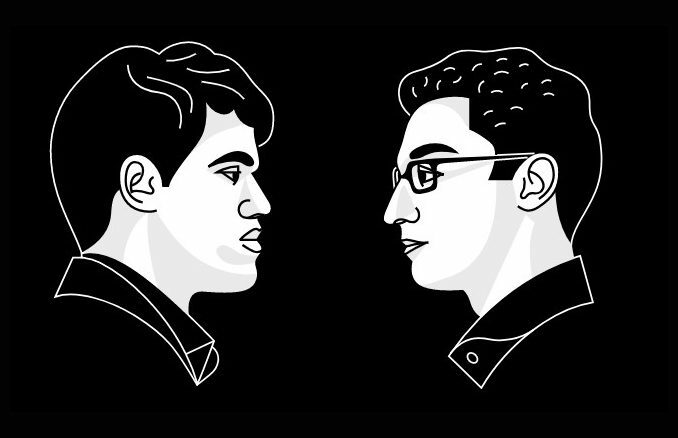 It saw Maxime Vachier-Lagrave retain his lead of the tournament with a draw against Shakhriyar Mamedyarov. Hikaru Nakamura was the sole winner of the round, taking a point from Richard Rapport. Rapport opted for Chigorin’s Defence to Nakamura’s Queen’s Gambit, which is a rather rare response compared to the more ‘normal’ answers of …e6, …c6 and …dxc4. However, with this being said, it makes perfect sense that Rapport played it — I am not sure what percentage of his games contain ‘normal’ openings, but it is certainly not high as of late. I find this really refreshing to see in top level chess, when players are willing to be creative and play chess rather than becoming too focussed on theoretical lines. It is a big risk to play with this style, and perhaps it is asking for trouble, but it brings with it the opportunity for the player to get the opponent out of their comfort zone. From the spectator’s point-of-view, it also brings huge excitement. As it was, Rapport didn’t do too badly from the opening, which saw the players castle to opposite sides and therefore the game became very much about King safety and open lines. White won Black’s f-pawn, but it is arguable as to whether this did him any favours to be honest, because it opened the f-file for Black. The initiative was with Nakamura, however, but the ever resourceful Rapport is so good at causing his opponent problems and finding unique ways around situations. Gradually the position evened out and Black had achieved equality at worst. Rapport’s crucial mistake came in the endgame, with 44…Nxf2+(? …Nhg5=) which was too complicit towards White’s wishes of exchanging down and pushing his very nice passed e-pawn. It also committed Black to exchange a piece for three White pawns. This is of course fair trade in many circumstances, but in this one, the piece was sorely missed. The game ended rather rapidly after this, with Black’s rook being confined to defensive duties, blockading the White passer. And with Black’s King being kept under wraps by White’s own rook, White’s King was left free to roam and have the run of the board. It would collect Black’s horrid pawns on the h-file, before proceeding to f6 in order to help the advance of the passed pawn. There was nothing with which Black could resist this and Rapport resigned. The rest of the games were drawn, but that is by no means an indication of a dull day. Even the 20-move draw of Grischuk-Aronian, (which might appear that the players just weren’t up for it at first glance), saw an unusual move order by Black in the Spanish, (9…Bb6 rather than 9…d6), resulting in White spending huge amounts of time before bailing. 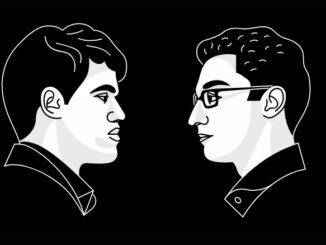 Maxime Vachier-Lagrave and Shakhriyar Mamedyarov drew a lengthy Ruy Lopez, in which Black equalised very comfortably and gradually became better. Mamedyarov took an extra pawn into the endgame and looked to have good chances, but 42…Nc3 was perhaps a bit slow and should have given way to …Nd4, which placed the knight better for both defensive and offensive possibilities. The game quickly fizzled to a draw. Black was also doing rather well in the Sicilian of Adams-Eljanov, in which White ended up passive. Black didn’t really make the most of it, though and this allowed White to seize the initiative back — and quite an initiative it was. Adams felt so comfortable that he sacrificed rook for knight and pawn and was substantially better. However, his 38.Qh4(?) gave Eljanov the chance to draw (38.Qxf7+ was a better try). Mickey admitted to having missed his opponent’s strong 38…Qf3(!) which saw White well and truly caught napping. Accuracy was now essential in order for Adams to even draw the game, with 39.Nf2 forced. This is how things went and Eljanov had saved the point. The Reti of Ding-Hammer was a very sharp affair, also. It was a game in which there were many swings in the balance, especially when Black gave up rook for bishop on move 25. It wasn’t quite sound, but White did not capitalise on it as he could have. Hammer managed to hold a rather tricky looking endgame, which included dealing with a rather potent passed White pawn on the b-file. His King got into the mix very nicely and the players repeated. Hou-Jakovenko, saw a Giuoco Piano in which the players manoeuvred and built the tension, but this was released by exchanges which saw the Queens come off and the position being largely simplified. They agreed a draw in 34. There were a few limp fishes of the round, Vallejo Pons-Nepomniachtchi, for example, got into a Queen’s Gambit Declined, but not by very much. The game simplified very quickly and hadn’t long left theory before they called it a day. The same for the Grunfeld of Riazantsev-Li and the London System of Tomashevsky-Salem. This left Maxime Vachier-Lagrave in the lead going into round four.